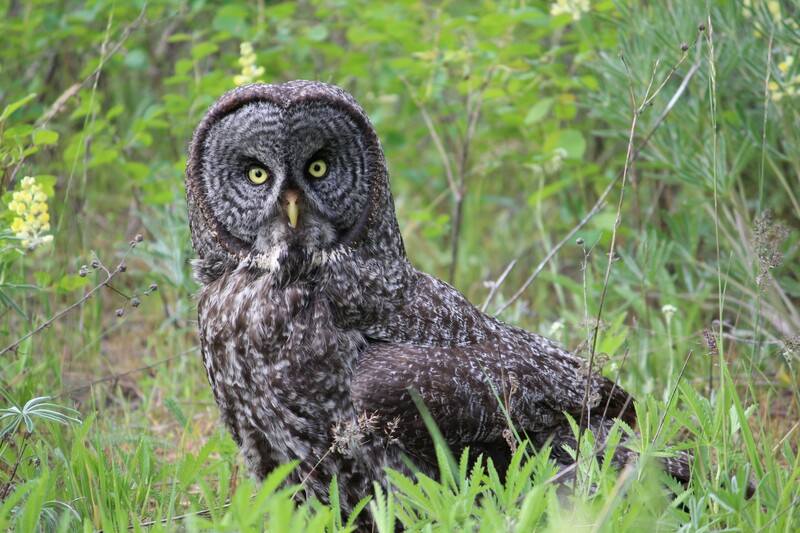 There is a series of four Great Gray Owl videos taken in March, 2016, near Howard Prairie in the Cascades east of Ashland, OR. 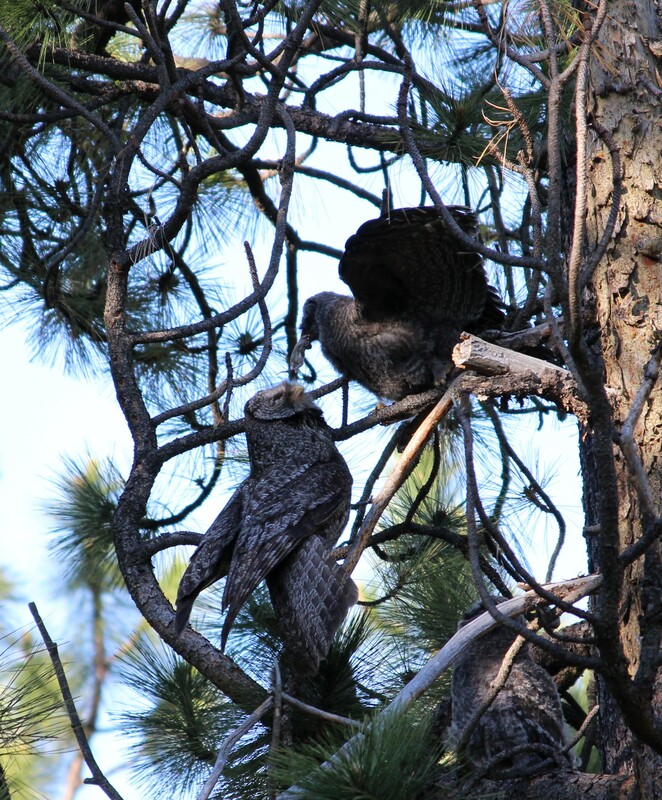 A blog on my birding site has links to each of the videos, including one showing the mated pair preening one another. Click for link to that blog. A Great Aridness. William de Buys. All the Wild That Remains. David Gessner. Book describes the environmental thoughts of Stegner and Abbey and author visits sites they knew and loved. When the Rivers Run Dry. Fred Pearce. Empire of the Beetle. Andrew Nikiforuk. 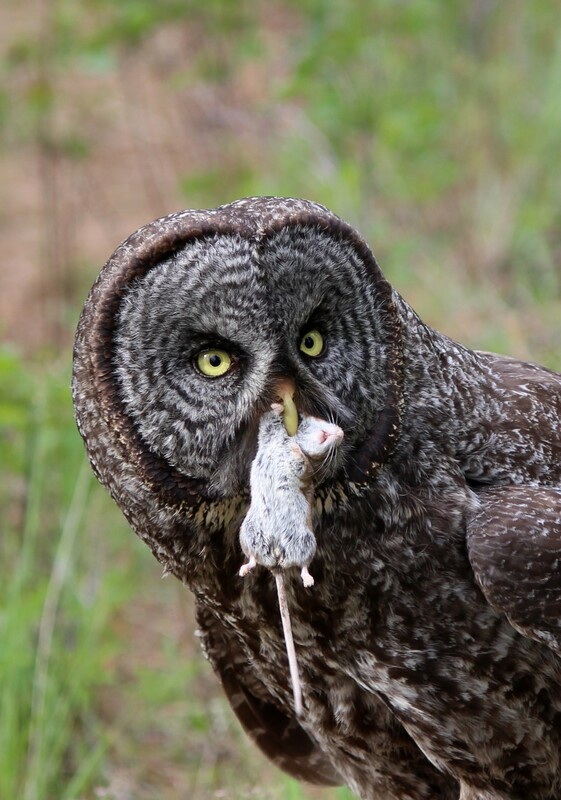 Birds as sentinel species: “Canaries in a Global Cole Mine?” pp. 1337-1338. “Ecology” 88(5), 2007. Review of the book Birds and Climate Change by Moller et al. Elsevier. Burlington, Mass. 2006. “How to Talk About climate Change So People Will Listen. By Charles Mann. “The Atlantic,” Sept., 2014. Climate-induced Faunal Change in North America. Joshua Lawler, et al. Ecological Society of America. “Ecology.” Vol. 90. March, 2009. 588-597. Climate Peril: The Intelligent Reader’s Guide to Understanding the Climate Crisis. By John Berger. Northbrae Books. 2014. “Climate for Coffee” in “National Geographic” magazine. Sept. 2015. Cool it. The Climate Issue. National Geographic. November, 2015. Drought to Extend Beyond Western U.S.
Sixth Extinction: An Unnatural History. Elizabeth Colbert. Henry Holt. 2014. “Extinction risk from climate change” letter in Nature 427, 145-148 (8 January 2004) | doi:10.1038/nature02121; Received 10 September 2003; Accepted 13 October 2003, By Chris Thomas, et al. Feral. George Monbiot. Penguin. 2013. Argues for helping all animals and plants find space for survival. Science 9 October 2015: 150-152. [DOI:10.1126/science.350.6257.150]. Describes environmental degradation of marshlands used by Asian migrant birds. Miami: The Siege of Miami. Elizabeth Kolbert. New Yorker magazine. Dec. 21 & 28, 2015. Pp. 42-50. Moller, Anders, et al. (eds). Feeling the Heat. Elsevier, Burlington, MA. 2006. Weather caused by climate change? http://www.nytimes.com/2016/03/11/opinion/what-weather-is-the-fault-of-climate-change.html? Why Are We Waiting? The Logic, Urgency, and Promise of Tackling Climate Change. Nicholas Stern. MIT Press. 2015. 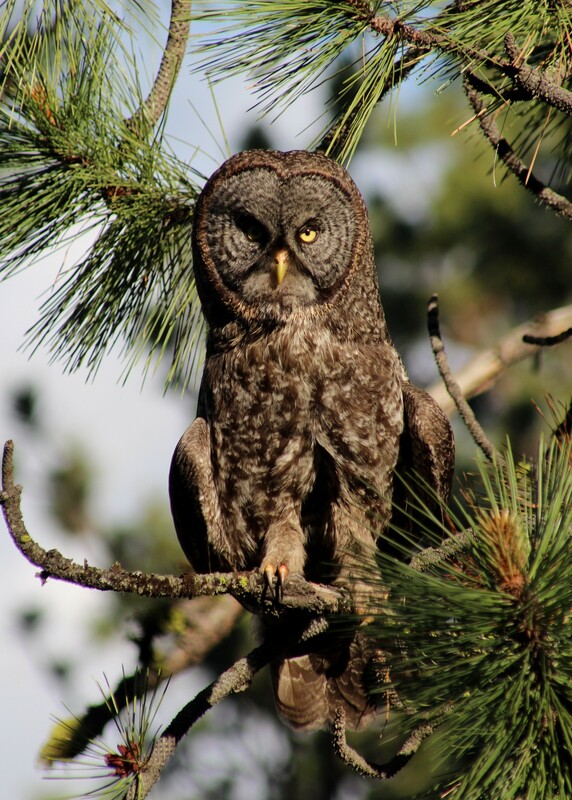 I speak about western birds and climate change at 530pm in Hannon Library at Southern Oregon University, Ashland, Oregon on the night of October 15th. Talk is free. CLIMATE CHANGE: A SELECTIVE BIBLIOGRAPHY FOR PACIFIC COAST BIRDERS This bibliography include articles and books that deal with species outside the Avian clan but changes in moose or monarch populations, or diseases in forest trees cannot be isolated from similar or related affects on birds. 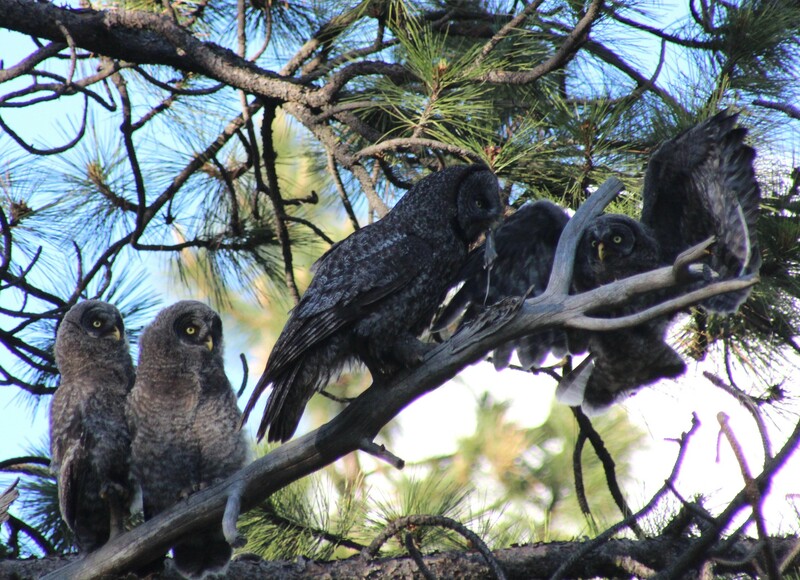 Here’s link to site about my book on the Pacific Slope Great Gray Owls. 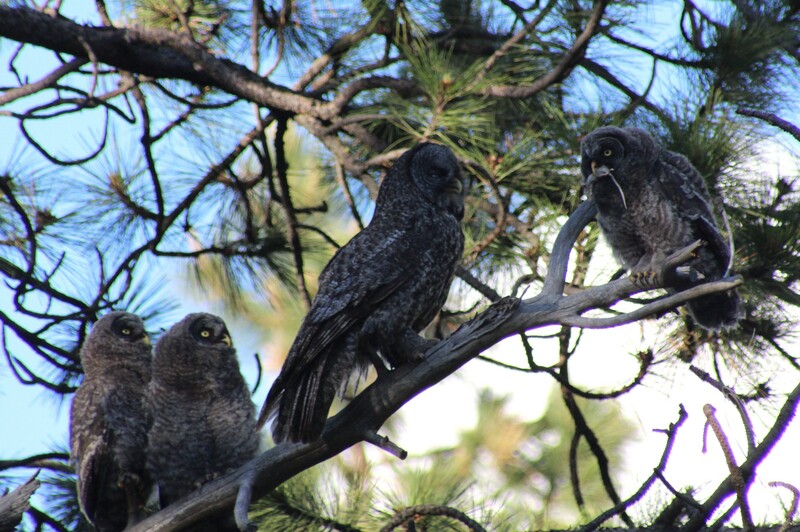 The Institute for Bird Populations has just published a study of all known Great Gray Owl nest sites in Yosemite area of the Sierra Nevada. Here is the official citing for the article: Wu, J.X., R.B. Siegel, H.L. Loffland, M.W. Tingley, S.L. Stock, K.N. Roberts, J.J. Keane, J.R. Medley, R. Bridgman, and C. Stermer. 2015. 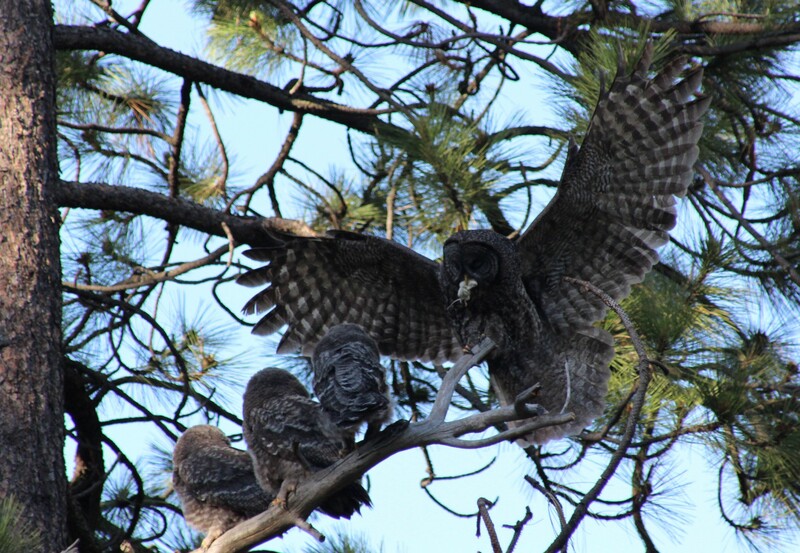 Diversity of nest sites and nesting habitats used by Great Gray Owls in California. Journal of Wildlife Management 79:937-947. It cost me $38 to see the whole thing so I will give you a summary. 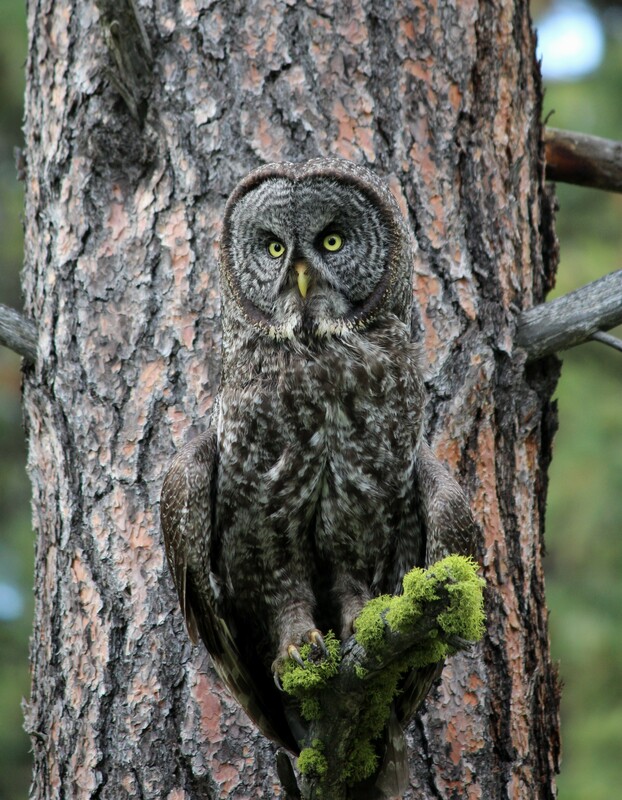 As I found when writing my Great Gray Owl book this species is NOT a strictly montane bird, nor is it confined to conifer forests. It may now be most likely there because we humans have driven them out of valleys and more oak-dominated terrain like the Sacramento and Willamette River Valleys where they may have nested three centuries ago. 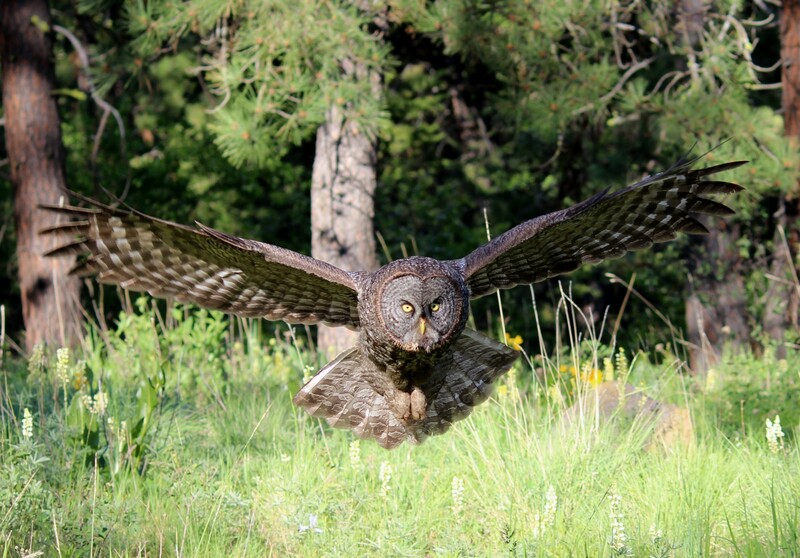 One-fifth of the nests in this study were found below 1000′ in elevation. 30% of nest trees were oaks, large oaks, within conifer stands. The GGO prefers well-rotted trees beneath a fairly dense canopy. Message to land managers: don’t rip down all your old, rotting oaks or Doug-fir. 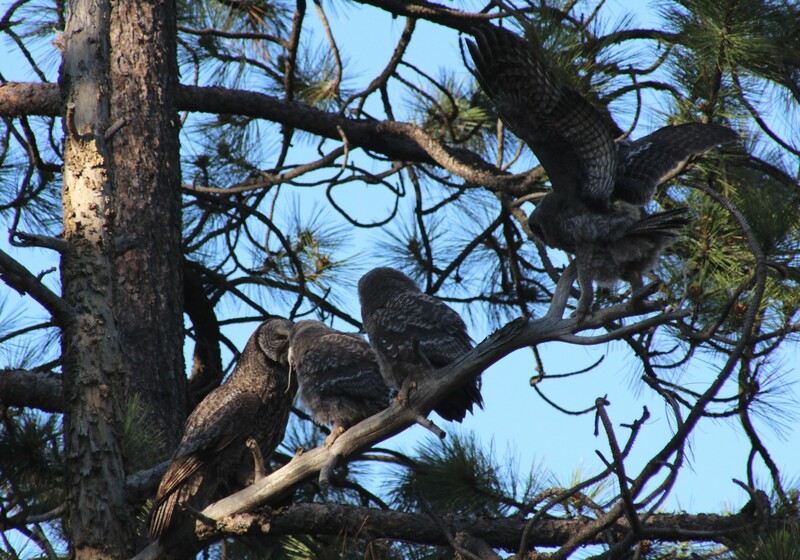 Slowly deteriorating trees like incense-cedar and sugar pines are not used for nesting. This study included no man-made platforms which are frequently used by Oregon populations of GGOs, both in the Wallowa Mountains and southern Cascades. 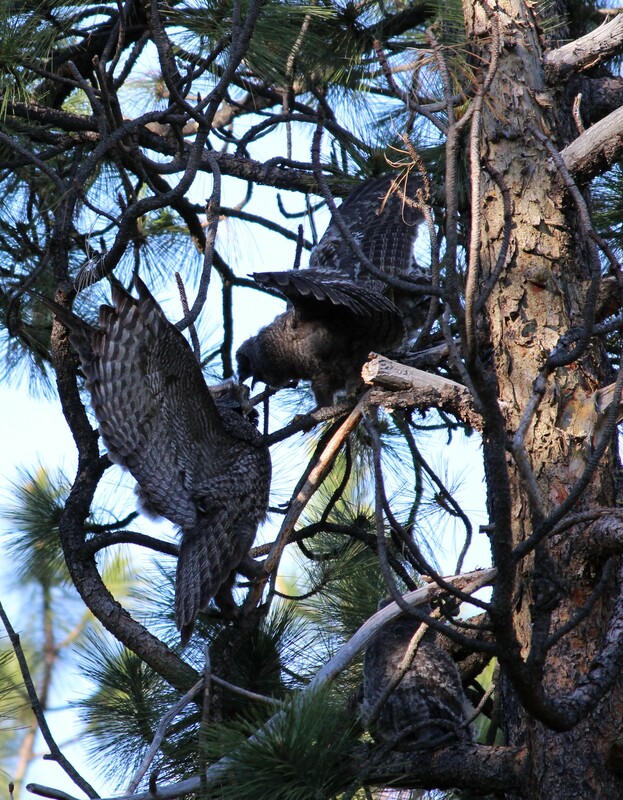 This study covered 56 nest sites in the California Sierra confirmed between 1973 and 2014. The southernmost one is on the Tulare-Fresno County border. That’s the southernmost GGO nest in the known world. 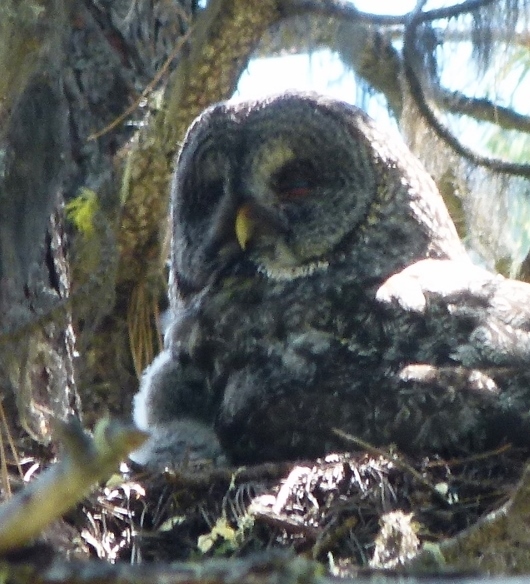 This picture shows female with owlet in nest that was probably originally built by Ravens, not in a rotted out, broken tree trunk as most often found in Yosemite area. The pictured nest was used only once in the southern Cascades of Oregon. 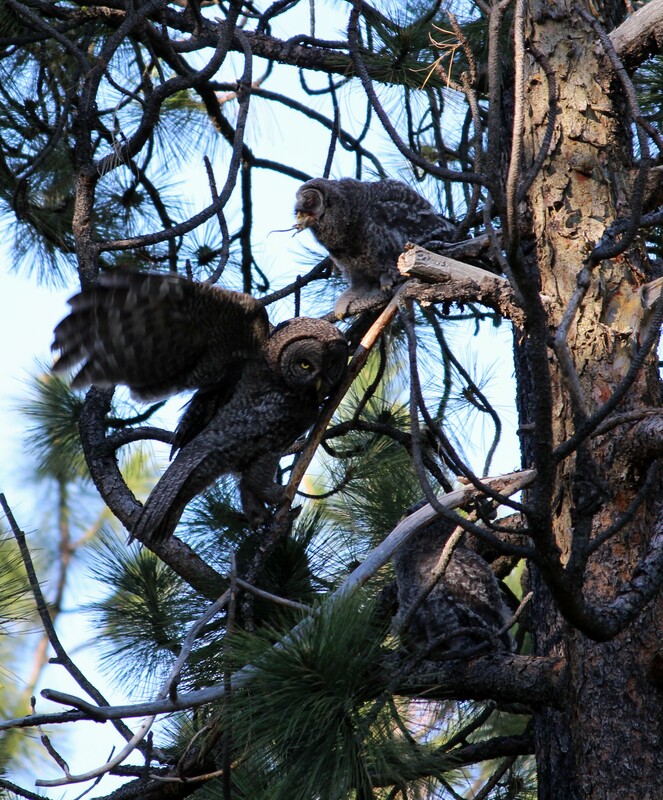 One of the two owlets survived fledging from this nest in a ponderosa. 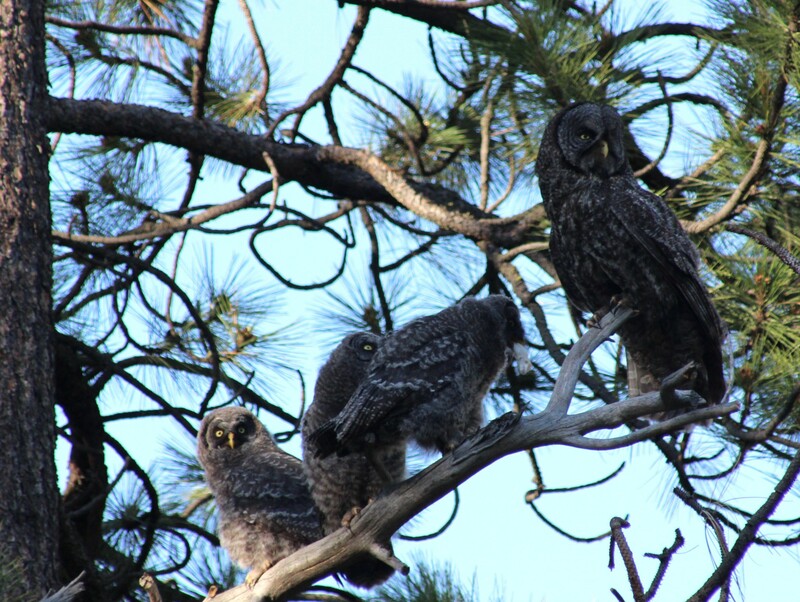 There is a quartet of owlets in this family and each can eat four small mammals per day, that’s a lot of huntin’ and trappin’ … for weeks. 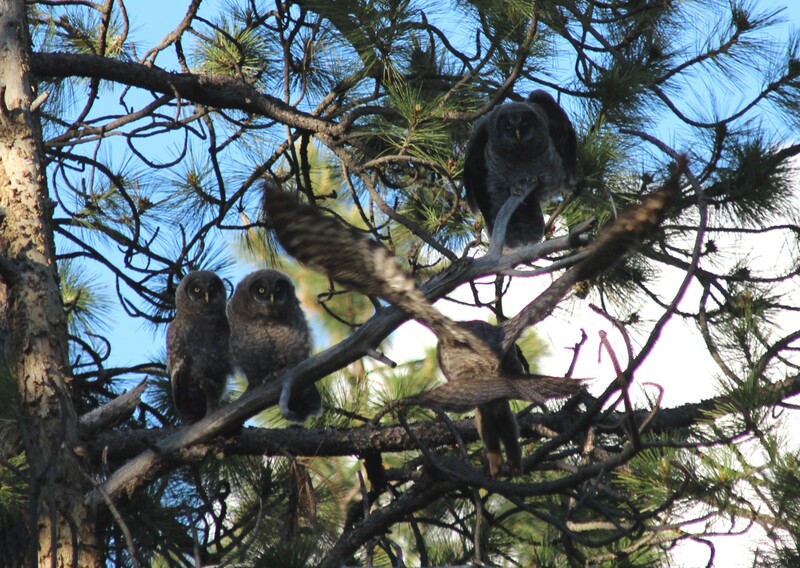 These youngster will not be effective hunters until very late summer at the earliest. Most abundant prey at that spot right now is kangaroo mice. 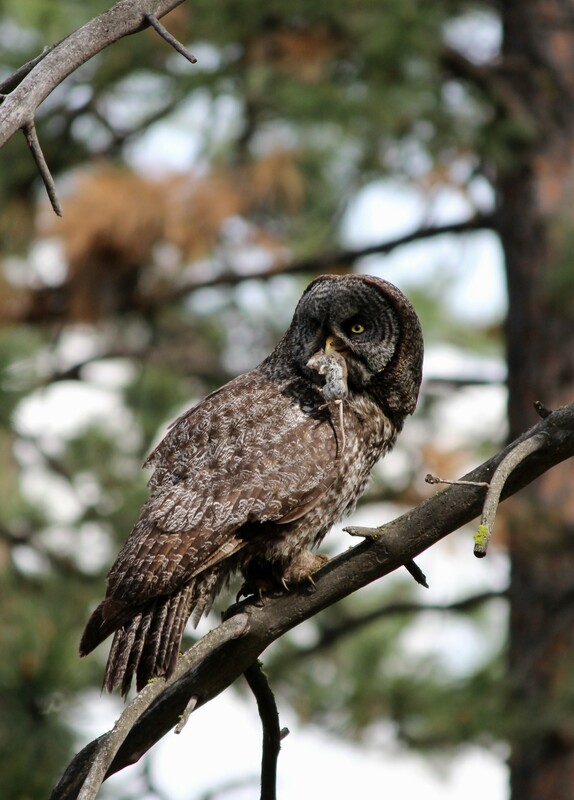 My new book on Great Gray Owls of California, Oregon and Washington is now available. Order yours direct from me, $28 plus shipping, over 100 photos and original range maps. More on earlier blog on this website.